CBC announced August 1 that Western alum Adrienne Arsenault, BA'90, MA'91, LLD'13, will co-host The National starting this fall, alongside Rosemary Barton, Andrew Chang and Ian Hanomansing. Arsenault is best known for her award-winning work as a globe-trotting senior correspondent. It has taken her to many far-flung countries — Pakistan, Libya and Zimbabwe, to name a few. Her coverage of the Ebola crisis from Liberia earned her an International Emmy in 2015, and she was named the Commonwealth Broadcasting Association's Journalist of the Year award in 2005. Arsenault has also been a foreign correspondent based in London, Jerusalem and Washington and a senior correspondent in Vancouver and now Toronto, from where she will be part of anchoring The National. "We all come from a reporting tradition," she said of her co-hosts. "We are all still reporters, and we are still going to be reporting." What will change, she said, is how they present the news. "We're trying to work hard to make the story the focus." Arsenault said her international travels have helped inform her reporting in Canada, where she has been based for the past few years. This has taken her to some of the country's biggest stories, including the housing crisis in Attawapiskat and last year's devastating wildfire in Fort McMurray. She knows the stakes for the revamped show are high. "It's not the model it has been, and that's OK. It's not the era it has been," she said. "We know there's a lot at stake, and we want to get it right. We're desperate to get it right." 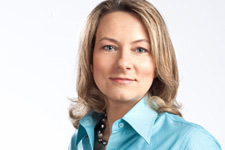 Arsenault has been close to The National since her CBC career began. She started as an editorial assistant in 1991 but actually had an interview lined up for her then dream job at CBC Radio's As It Happens. She got lost in the CBC building and wound up in The National newsroom, where someone offered her a job on the spot. Now 26 years later, she is poised for one of the show's top jobs.